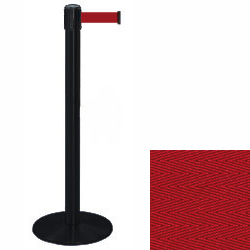 This black stanchion w/ maroon belt for crowd control in ticketing venues, museums, hotel lobbies, blends appearance and function for an all-out great crowd barrier system. 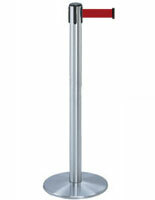 This Tensabarrier post system includes a 7.5' retractable satin rope and it's best when they are placed 7' apart. 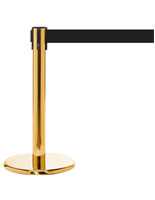 This popular black stanchion w/ maroon belt is tops in this market so there's no need to shop around! 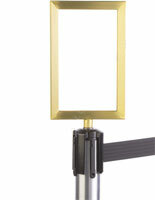 Barrier system dimensions are 38"H, 13.5"D, with a weight of 24 lbs., making it easy to carry. 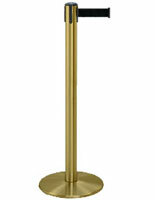 The stanchion rope is 2" wide and the metal base is weighted for stability in periods of high traffic. 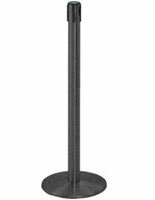 For higher traffic points, we recommend using Dual Belt Posts. For assistance with various layout options, designing crowd control systems.